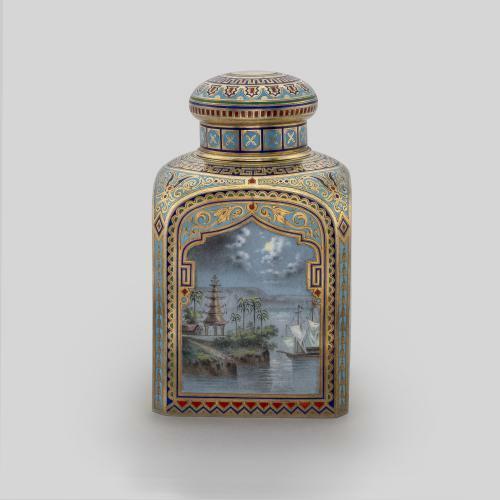 The imitation of Chinese art and imagery, a style known as Chinoiserie, first became fashionable in Europe in the second half of the 17th century. 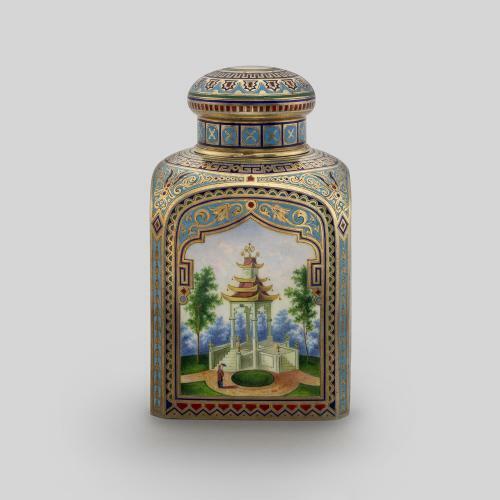 Despite geographical proximity and trade with China, it wasn’t until the end of the 18th century that Russia began borrowing from East-Asian motifs, mostly due to Russia’s fascination not with Chinese but with French styles. 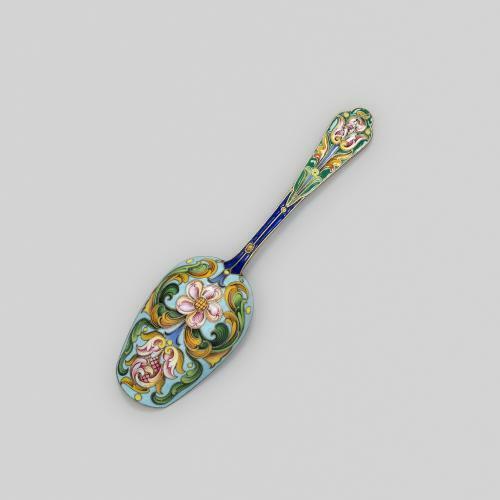 The style was popular in Russia for a short time during the reign of Catherine the Great (1762-1796), and was often combined with French Rococo and other European motifs. 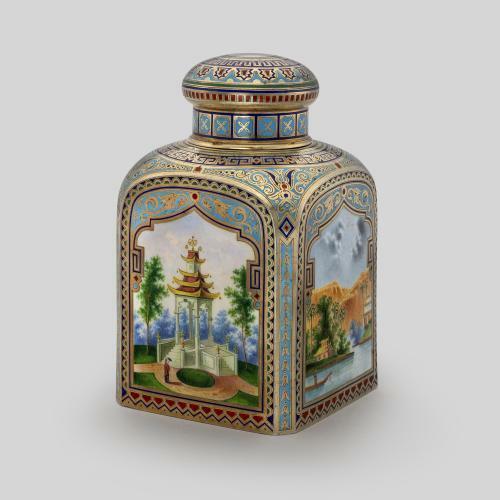 This tea caddy made by the firm of Pavel Akimovich Ovchinnikov exemplifies the fanciful imagery and strong colours often found in Russian Chinoiserie scenes. 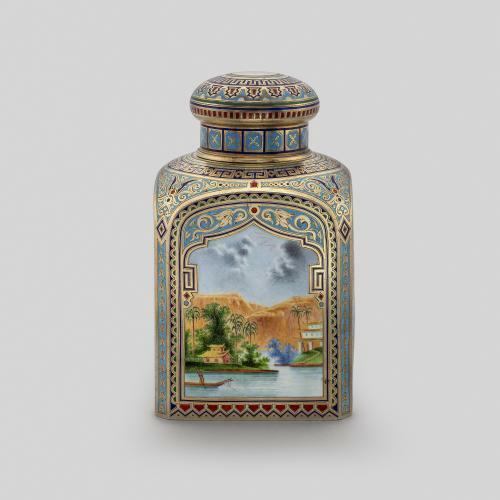 Each scene is decorated using painted and en plein enamelling, an extremely difficult technique which is used to enamel large surfaces. 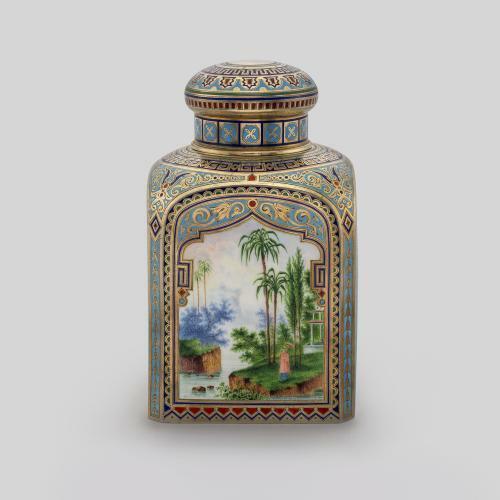 In this technique each side is painted with enamel pastes of various colours, before the surfaces are entirely covered in transparent enamel, applied in layers of glass powder which are fired at high temperatures to create a smooth finish. 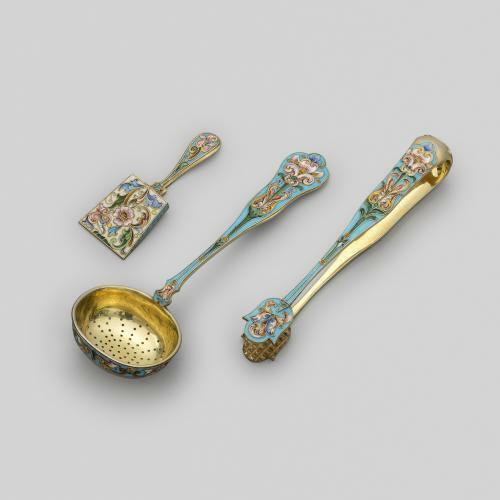 The difficulty lies in the risk of warping the metal during the multiple firing processes, which would not only ruin the desired smooth finish but could also damage the airtight seal of the silver caddy.